Timing is everything. Trust is essential. Everything happens for a purpose. These are some of the phrases you might hear in the offices of Fierce Freedom, an Eau Claire-based organization dedicated to fighting human trafficking in the Chippewa Valley, Wisconsin, and soon, nationally. Jenny Almquist started the project in 2007 as a fundraising effort. She sold fair-trade scarves at parties where she educated groups on the methods and impact of trafficking, donating the proceeds to nonprofits that help affected people. Soon, she began to get calls from those who wanted her to teach them about the issue, which affects an estimated 25 million people around the world, including right here in Wisconsin. “It was obvious that it was time to change from a fundraising organization to an educational organization,” Almquist said. She was being sought out by local law enforcement groups and was asked to speak at a conference hosted by the Wisconsin attorney general. Fierce Freedom became a nonprofit in 2012 and has been growing ever since. Cat Jacoby, who coordinates programs and public relations, and Tia Johnson, survivor advocate, describe Almquist as a mother lion, and themselves as her cubs. Jacoby was moved by a film screening hosted by Fierce Freedom during her studies at UW-Eau Claire. “Seeing the children that are exploited and being taken advantage of, and the horrendous things that are happening to them, made me sick to my stomach but also lit that fire of passion,” she said. Unfulfilled by her first job after college, she took up volunteering with Fierce Freedom. Almquist offered her a position with the organization shortly thereafter. Fierce Freedom defines human trafficking as a situation where a person benefits from the control or exploitation of another individual. This might be as clear-cut as when a person is kidnapped, sold, or forced to perform labor or sexual acts. Sometimes, however, it is more difficult to identify. Fierce Freedom advises people to look for signs of force, fraud, and coercion – any or all of which are indicators of trafficking. The National Human Trafficking Hotline dealt with 91 reported cases of human trafficking in Wisconsin in 2017, though it is difficult to determine the number of unreported cases. Many victims are or feel unable to seek help, and still others do not perceive themselves as in need of assistance. The organization has seen an increase in reporting since 2012, when they saw 27 cases in the state. Today, Fierce Freedom fights trafficking mainly through education. The organization offers a number of programs that teach people how to identify trafficking, how to report it, and how to protect themselves against becoming victims. Youth outreach programs give young people the resources they need to identify negative pulls in their lives and move toward positive ones, making them less vulnerable to potential abusers. “We want the word to spread like wildfire across the nation,” Jacoby said. “We can’t really travel all across the country to do that because this is where our heart is and this is where we’re centered.” But they have a plan. Jacoby is spearheading the development of an online course to train volunteers in fighting trafficking in their own communities. Interested parties would be vetted by the Fierce Freedom team, and pay a small fee for the use of the program, which would prepare them to educate others in prevention, identification, and fighting back. “We’re trying to work ourselves out of a job,” Jacoby said. Johnson is an essential element to that end, Almquist said. Just since she joined the team three months ago, Fierce Freedom has worked directly with nine survivors from throughout the state, including some extraction work. Johnson’s experience as a survivor helps her build trust with others, and allows her to help them through their journey. She believes she endured hardship for that reason, and to make her home a better place. “This is the community that I grew up in, and was raised in, so to be able to work in this community and fight the negativity in my community is really cool to me,” Johnson said. Almquist is thankful for those she works with every day, including Office Administrator and Race Director Carrie Schwartz. Nicole Schultz serves on the board, which is headed by Jennifer McBride. 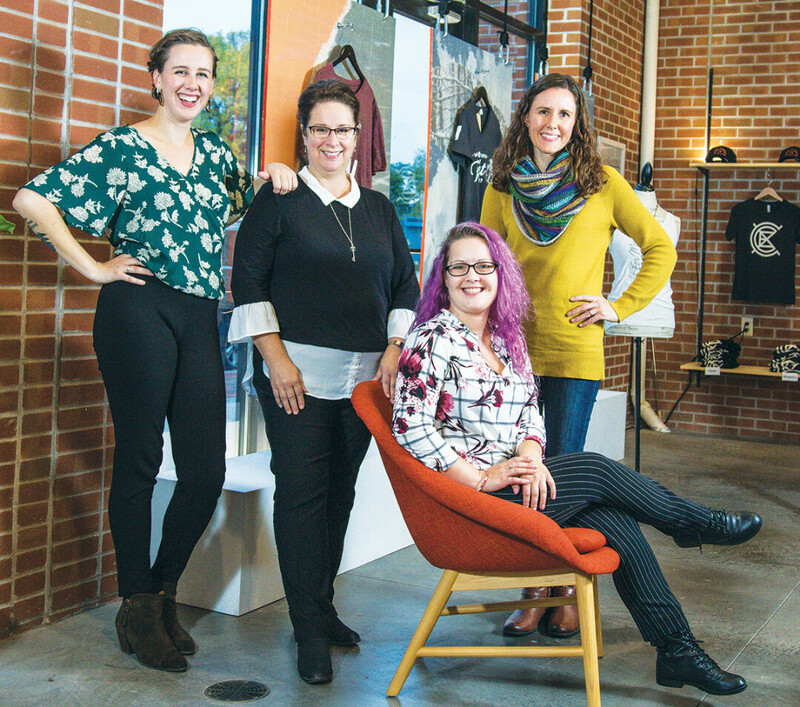 “Because they do what they do so well, it gives me the freedom to dream big,” Alquist said. “I felt that they were coming after my children,” Almquist said. When she started the organization more than a decade ago, her own children were still living at home and she couldn’t stand the thought that they, and the children of others, were at risk. “This is not going to happen on my watch,” she thought to herself, and she never looked back. Fierce Freedom offers educational opportunities, resources, and events to fight human trafficking. For more information about the organization, visit www.fiercefreedom.org.